How do you feel when you see that jury summons in your mailbox? Most people grumble, and in a way, I do, too, but I'm serving jury duty today, Monday, and I'm actually glad to be going. I haven't been chosen in a long time. I have sat on panels, but I was always far enough back not to get selected. The one trial I served on was rather boring, but I still got about a week off work. It was a trial in federal court because it involved the international television rights to soccer broadcasts. There were companies from the US, Mexico, and Brazil involved, and MILLIONS of dollars at stake. But it was terribly boring! 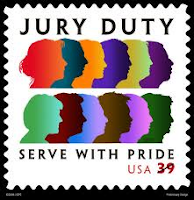 I got called for jury duty a couple of years ago, and I was so glad not to be chosen. Why? It was a gang related murder trial. The defendent was a 15 year old female. It involved one of the more violent gangs. And one time I sat on a panel of a custoday case. The child in question was severely disabled but technically an adult, and neither parent wanted custody. It was so sad, so not getting selected for that was a blessing. My husband served on a medical-related trial for about three weeks last year. He said it was pretty interesting. I won't mind if I get selected today, as long as it's not too boring. I would welcome a week off work right now with Thanksgiving coming up. (crazy kids!) When was the last time you were summoned? Have you ever served on a trial? I've never been selected. I think part of it was I was active duty military and living out of state for 5 years. If my kiddos were a bit older, I won't mind serving. Hope you get something interesting today.